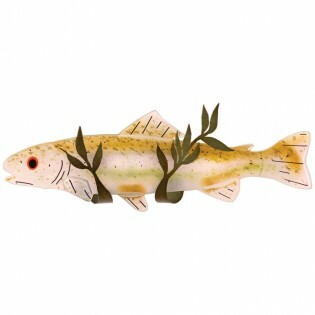 The Trout Wall Sconce Offers An Innovative And Striking Fused Art Glass Design In Our Popular Metro Fusion Group. Handcrafted In Colors Of Pink, Amber And Green, The Rainbow Trout Glass Wall Sconce Is Accented With Red And Black Eyes, On Metal Olive Green Leaves. A True Work-Of-Art, Ideal For Sportsmen and Outdoor Enthusiasts.